We are enjoying a week of non-stop sunshine and beach visits this week. Ice creams, sand, sun and sandcastles everyday. I hope the kids always have good memories of Christmas time. Sydney has such a magical feel right now with everyone in true holiday mode. Christmas was a blur of presents, fun, seafood and wine. We celebrated with some friends who hosted the most delicious lunch that spanned the whole day and into the night. One thing happened that really marred the whole magical time. I took the kids to one sale post Christmas and then to our local library because it was raining that day. As we were leaving, no wallet! I knew I had it, but just could not comprehend someone stole it. Denial! I was convinced it was lost. I retraced our steps, looked under chairs and tables, but no wallet. I ran one errand, headed home and rang my husband to explain the situation. He rang the bank and they had charged $5,000 in one hour. Now tell me, how did they manage to find a park at a mall in one hour during sales time? Now I am in post-traumatic wallet stolen syndrome. I keep remembering things I had in it. No credit cards or cash card either! Ahhhh. I am trying not to dwell, but it has really bothered me. I feel a loss of innocence. I also hate that it happened at our local, small library in the kids section too. 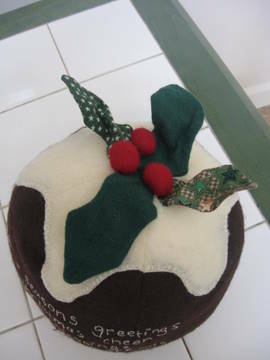 Photos are of some Christmas baking, the holy grail of Christmas presents (bug vacuum) and one of the Christmas presents I made for some friend’s little girls. I will try and get some photos of them modeling the horse shirts. P.S. 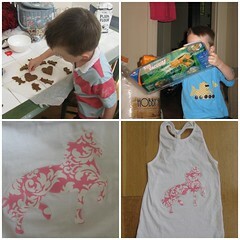 The horse template / idea came from the Anna Maria Horner show on Martha Stewart. Here is the link. Last of the Christmas craft wrapping up as I type. I hit the shops at 8AM this morning and it was like WAR had broken out. My goodness. For the international readers, Australia closes down for two days for Christmas and Boxing day. Not a lot is open, so food shopping becomes a competitive sport. I am trying to keep my chin up in my destroyed house around the holidays. We are definitely not living the Martha Stewart dream this holiday. Good news the painting is done, but he ripped down most of my Christmas decorations in the process. Sigh. Have you seen the worlds cutest Xmas gingerbread ornament on Jodie’s website? 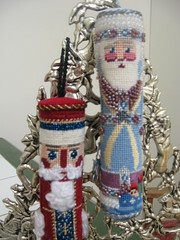 Go visit and will be making these next year for sure. 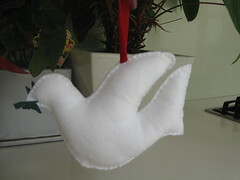 This peace dove was thanks to Bella Dia’s gorgeous website. Talk about inspiring for Christmas! Wow. Love this website. So I heard things start looking worse before the get better. I am surrounded by cardboard boxes which are multiplying like rabbits. This selling / moving caper is not for the faint of heart. The house is a bomb site! Santa was a big hit yesterday and we had the “chat” about the adult words being used. What am I going to do post Xmas in terms of behaviour bribery? Sloan took one look at Santa and burst into tears and yes, I made the photo again this year! I have to thank the Sydney public at large on public transport. We took the commuter bus into the city and people leaped to their feet to surrender their seats to the kids. On the train strangers helped me on and off the train and a construction worker at the North Sydney station helped me up three flights of stairs because there is no lift. Go Christmas spirit and good karma to all. 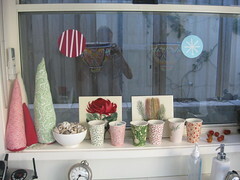 Here is a photo of the kitchen with some gorgeous handmade porcelain coffee cups I recently bought at the Paddington markets. They are a bit off in shape, but I love it. The patterns remind me of fabric and are so sweet. Right now they are just for looking at, but we will use them post Xmas. P.S. Stellar photography on my part. See my reflection? We are having an early start today thanks to Sloan deciding she must wake Mommy up after Mommy’s late night Christmas party. Sigh. We are braving David Jones for Christmas photos today which involves a bus ride with two kids and pram into the City. We aren’t that far from home if it gets too ugly. Last year I had to be in the photo because Rhys wasn’t quite sure about the whole visit. There I was still looking quite huge post baby with a very, very generous bosom. Lets hope I escape photos this year. Lets just say I am going to have a little fireside chat to Santa in front of Rhys about the use of “adult” words. Rhys has been throwing around a very adult swear word that starts with a “f” about once a week. We do not swear in front of the kids, so I can say it is not coming from us. I am really embarrassed about it and going to have to do a Dr. Phil website search on how to break this habit. I notice he especially uses it post school. Nice. 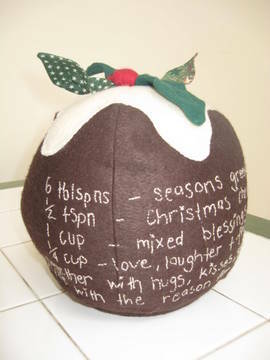 Enclosed is a photo of a Christmas pudding I put together last year as my one and only Christmas craft I attempted post Sloan’s arrival. The pattern was purchased at Spotlight about three years ago. Notice a pattern? I buy things and it takes me years to finally make them! This is one of my favorite handmade ornaments. I made a famiy of horses in all different colors of felt for my brother’s family two years ago which were all quite sweet. I made one for Rhys in his favorite color and plan to add a pink one soon for Sloan. 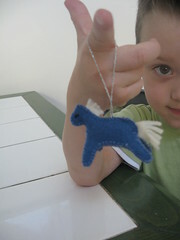 The horse is felt with blanketstitching holding it together. 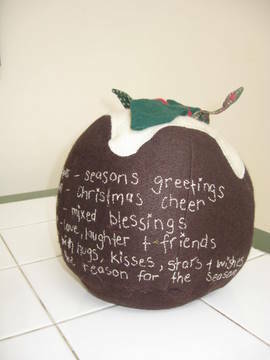 The original idea and pattern came from Turkeyfeather’s website, however I am not sure where it is on it as it was two years ago. I couldn’t find a search facility on the site, but I am rushing to get the obligatory “Christmas haircut and color enhancement” in about 15 minutes time. Ironic title to the post because I haven’t been sewing too much lately. Tonight I did squeeze a few minutes at the machine to finish a few small projects. I am going to do some short, but sweet posts for the next week. I thought I would share a few of my favorite homemade Christmas decorations during the build up to Christmas. 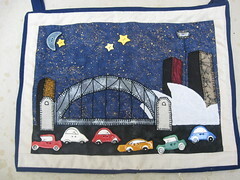 I bought this sweet Sydney street scene two years ago at the Darling Harbour quilt show for what I thought would be our second baby boy. Sloan showed up and this got shelved to the side. I finally finished it and have a little someone who will be receiving this for Christmas. KrazyKreations is the company who designed it as a kit. I just checked their site http://www.krazykreations.com.au and did not see it, but they might have it available still.